Check out these beautiful snow scenes. The Homewood Ski Resort is located on Lake Tahoe, in Homewood, California. This resort offers something to do for those who wish to ski the mountains or explore the lake. The region is one of the most scenic regions in the country. This resort helps people to enjoy that natural beauty. The Homewood Ski Resort offers numerous amenities for visitors. From the shores of the lake up to the summit at almost 8000 feet, there is something here for everyone, all year round. There are more than 100 runs here, and a vertical of 1650 feet. The resort is a favorite among tourists, but also among the locals. The resort has been operational for 50 years. It gets 450 inches of snowfall, on average, yearly and does have snowmaking abilities for seasons with less snow. It projects to be open for 150 days of the year, though in the 2008 season was open 180 days. Approximately 50 percent of the runs here are intermediate runs with 35 percent dedicated to advanced skiers. There are no expert runs at Homewood. Homewood offers several options for lodging. Visitors may select from traditional hotels and motels. Small inns dot the location as well. There are also cozy log cabins in the area. Private rentals are available for those wishing to stay nearby. When selecting lodging, determine what discount offers or "ski and stay packages" are available. Most lodging venues offer some type of discount offer for visitors. It is also best to book in advance, especially during peak seasons. Several instructional programs for visitors are offered at Homewood. 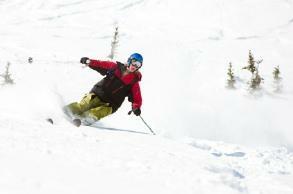 The ski and snowboarding schools provide instruction for all ages. Beginner classes to advanced classes are available. First timers will find the beginners class ideal. The resort offers adult lessons, children's programs and private lessons. The adult lessons are intended for those who are 13 or older. Currently, the beginner programs are only available on the weekends. Children as young as four can sign up for lessons, though the center does require an adult to be present throughout all lessons. Homewood provides a range of services and attractions for visitors. Guests are welcome to simply explore the area on their own or use any of these services to help them to get the most out of this ski resort. Rentals: A full service rental facility is located in the North Lodge area of the resort. It features gear for children up to adults for snowboarding and skiing. Prices vary, but discounts are often available through your place of lodging. Seniors: Seniors may obtain discount skiing and snowboarding passes. Those over the age of 62 can often ski for as little as $10 a day. Savings: Packages and value lift prices are often available to make skiing and snowboarding more affordable. In some cases, purchasing in advance online can help individuals to save more money. Snowboarding: Homewood allows snowboarding on all open trails within the resort. This includes several terrain parks. Those who are new to snowboarding are welcome to enjoy the resort or take lessons. The Paintball Playground is opening in the summer months. Visitors may rent equipment. Weddings and special events may be booked in advance at the resort, both for indoor and outdoor events. There is a large Farmer's Market located within the resort. Outdoor arts and crafts fairs take place at the resort year round. Try to call ahead for booking information or to find out a schedule of events. For those wishing to explore Lake Tahoe, the High and Dry Marina offers powerboat rentals and dry storage. The Marina is just a few minutes' drive from Homewood Ski Resort. Lake Tahoe offers water skiing, jet ski rentals, boat charters, sailing tours, eco-tours and sailing lessons from local merchants.